Russia has announced the start of work on the creation of a sixth-generation fighter jet. The body is to be made of composite materials and it should attain high speeds and have the latest electronic warfare equipment, avionics, and a propulsion system. However, the kind of combat missions the new vehicle will be expected to fulfill are unclear. Russian designers have already started work on the creation of a sixth-generation fighter jet, according to director general of the Foundation for Advanced Research Andrei Grigoryev, who informed journalists of the development at the Open Innovations Forum in Moscow last week. “Our task is to lay the groundwork for the creation of asixth-generation fighter jet. Such projects are also now being considered. They are primarily associated with materials and engines,” he said. According to Grigoryev, the new plane will be manufactured from composite materials. Although comments made by a number of specialists from the aircraft industry or the Russian Air Force indicate that while work on the project has already begun, a common vision for the aircraft is yet to be worked out, the general approaches to the project are well-known. The aircraft's body will be made of a highly durable and lightweight composite material. The fighter jet must possess not only supersonic speed but must be able to attain hypersonic – over Mach 6-7 – speeds at certain stages of flight. Not every metal is capable of withstanding the heating of the fuselage at such a speed, meaning that the creation of a new composite capable of meeting all of these requirements is necessary. “Number Six” needs a new and powerful engine able to function not only in the atmosphere, but also in airless space. It cannot be excluded that one of the tasks of the new craft will involve exiting into open space and flying in an orbital trajectory. Also needed are a new antenna system and avionics system capable of functioning effectively and stably in all flight modes and all circumstances and of maintaining constant communication with ground and air command centers and spacecraft, as well as an onboard electronic warfare system designed not only to suppress the communication and control systems of a potential opponent but also to neutralize air-to-air or surface-to-air missiles. If everything regarding the ‘filling’ of the aircraft and its lining materials is clear, then the main question is whether a sixth-generation craft should be manned or unmanned. 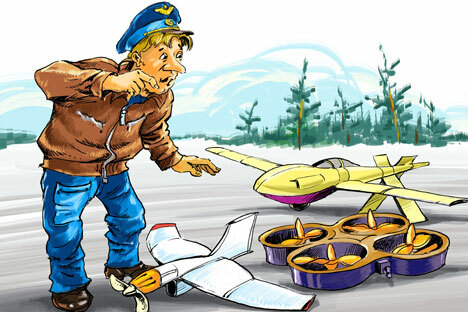 The advantage of an unmanned craft is that there are no risks to the life of a pilot, the preparation and training of whom costs immense sums of money and takes a rather long time. Additionally, a drone does not require a human life-support system onboard and its flight time is not tied to the physical capabilities of a pilot. However, a robotic drone, no matter how highly intelligent its electronic computing system, must be controlled from the ground by operator commands. And these, for various reasons, can fail to transmit or be delayed. This fact alone speaks to the advantage of a fighter jet operated by a combat pilot. Who will jet be fighting against? Some things remain unclear regarding combat tasks. Who will the sixth-generation fighter jet be battling against? There are only three or four countries today capable of creating a fifth-generation fighter jet. One of these is the U.S., which already has F-22s and F-35s in the air – one of them even participated in bombing Islamic State terrorists in Syria. Another is China, which has disseminated photographs of its fifth-generation fighter jet on the web, as well as India, which is creating such an aircraft in cooperation with the Russian company Sukhoi. However, it is very difficult to imagine any of these states, which incidentally have nuclear missile arsenals along with fighter jets, going to war against each other. The risk of receiving a nuclear missile strike in response to aggression is simply too great. Then against whom will the fifth- and sixth-generation fighter jet be directed? As of yet, there are no definitive answers. For now, the work on the creation of the “fighter jet of the future” is still on the drawing board and its designers, along with the military men ordering its production, need to come to a common understanding regarding the shape the future combat vehicle will take, and the missions and targets that it, its weaponry, and its pilot will face in the future.